MEMSA license plates are available ONLY for registered Missouri vehicles for a donation to MEMSA of $15 for a one-year registration or $30 for a two-year registration. If you need a license plate, you will need to complete the new/initial application process. Step One: Register online with MEMSA using the form below. Once you have registered for a one or two year registration and paid your fee online, you will receive a License Plate Emblem Use Authorization Statement & Receipt by e-mail. Step Two: Download the Application for Missouri Personalized and Special License Plates - DOR 1716 and fill it out. You will then receive a notification letter when your license plates have been sent to the license office you indicated on the front of your application. Please allow several weeks after the license plates are ordered for the notification letter to arrive. 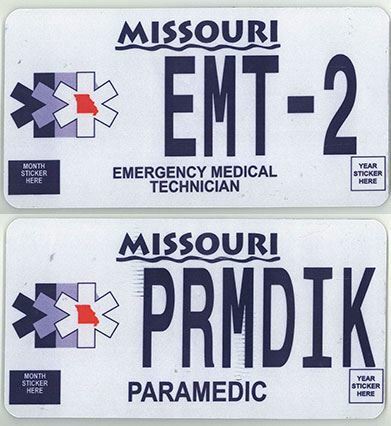 Note: if you already have an EMT or paramedic license plate, please follow the renewal process outlined here.